We all probably spend too much time looking at pictures of watches on Instagram. But if there’s one account to follow, it has to be @pbandwatches. By showing his impressive collection of timepieces against the backdrop of his own inspiring lifestyle, he makes being a watch fanatic look like the most enviable pastime in the world. Certainly, his 80,000-plus followers agree. So we asked him a few questions about how he documents the good life - and kicked it up a notch by doing it on a custom road trip to Prince Edward County’s Drake Devonshire in a bright red Jaguar F-Type SVR. Here’s what he came back with. When did you start PB and Watches? I had been collecting watches for some time, and in 2013 I started posting a few shots on my personal feed. An old friend of mine told me that no one wanted to see my watches on Instagram and BOOM: @pbandwatches was born. Sometimes you need to take those lemons and make some unbelievable bourbon sours. What was your first watch - the one that turned you into a watch guy? The watch that started my collection was a Tissot PRC 200 that Mrs. PB got me. She says it’s the moment she knew watches were my thing, because apparently after she gave it to me, I immediately told her the next one I wanted. That watch will forever be in the collection, because you can’t sell a watch with an engraving on it. Unless you’re Paul Newman. How big is your collection now? I started collecting 13 years ago. The size of my collection will stay a secret, but it’s more than 25 and less than 300. I collect off emotions. Every watch is there for a specific reason - a milestone or moment in my life. My favourite, however, will always be my Pam 510. It was a gift for my fifth wedding anniversary, and the only time Mrs. PB has ever truly surprised me. It’s the only piece in my collection that money couldn’t buy. Am I allowed to pick 10? Some top pieces I’d love to have in the collection would be an AP full ceramic Perpetual Calendar, MB&F Legacy Machine Perpetual, Rolex Rainbow Daytona, RM 35-02, or Patek 5980 Blue Dial. If someone wants to give me a huge bag of money to help with this, slide into my DMs. Since launching PB and Watches, you’ve become a big part of the watch community. What’s been the best part of that? There are lots. Like any watch collector, my first Baselworld experience was pretty outrageous. You spend a week living off champagne, espresso, very little food, and absolutely no sleep. I’ve been three times now and the novelty hasn’t worn off. I also have great friends that I met in a restaurant in Florence, Italy, just because we started chatting after my watch hit my food for a photo. We travel yearly with them to different places around the world, and if it wasn’t for this hobby of mine, we’d have never met. Tell us about your process: what do you shoot on? How do you go about composing a shot? How do you curate the feed? You can ask anyone who knows me, and they’ll tell you the same thing I tell everyone: “PB shoots with a Motorola Razr.” Whatever you see on my feed is a real-life moment…that I stopped to throw a watch on. I could be out for lunch, on vacation, or out for a drive, and if I have an urge to take a photo, I’ll stop whatever I’m doing and set up a shot. If you’ve ever eaten with me, you know the pain of waiting while your food becomes my prop before you’re allowed to eat. I’m a self-taught photographer, so my techniques might not be typical, but they seem to do the trick. For me, it’s about going with your gut and having fun… with a side of obsessing over french fry placement. 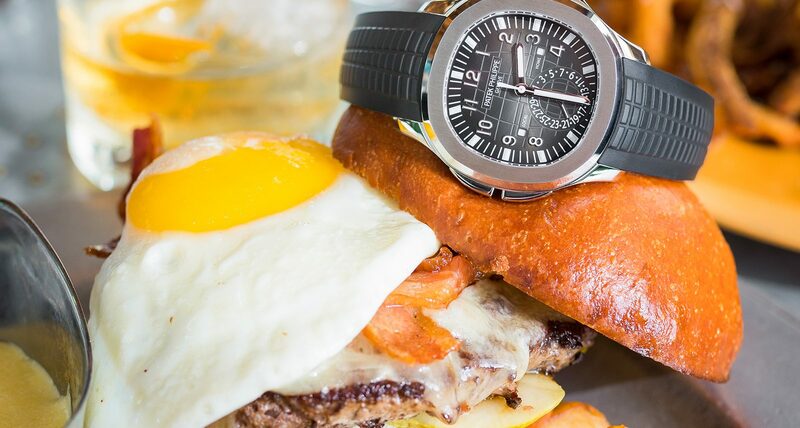 What’s the secret to taking a great watch picture? Step 1: The most important step. Always clean your camera lens. Step 2: Make sure there is a minimum amount of glare on the dial. Step 3: Make sure the watch is in focus. Step 4: Get creative and have fun with it. Step 5: Never worry about 10:10 - nobody has time for that. Based on your feed, you seem like a guy who enjoys the finer things in life: cars, cocktails, food, etc. What is real luxury to you? Anyone who knows me knows I love things…and stuff…and more things. Honestly, though, it’s about the experience that goes with them. I’ve always appreciated the passion that goes into crafting something or the memory that comes from sharing a moment with friends and family. Cracking a rare bottle of scotch or smoking a perfectly aged cigar is more about who you’re with than the item itself. Can you share some of your personal advice for guys looking to live well? Learn how to make a great cocktail - that’s entertainment 101. Don’t keep the stuff in the safe - watches were meant to be worn. Surround yourself with people who believe in you, because there’s no better feeling than that. And never cut corners when it comes to life experience. Travel to all the places - and see you in Basel!